This is a hugely useful diagnostic tool and we scan every new patient who comes through the door. It gives a detailed view of everything and lets us know if we need to take close-up X-rays of problem areas. This OPG takes a wide view of the lower face, displaying all the teeth and the upper and lower jaw on a single film. It shows the number, position and growth of all the teeth, including those that are unerupted. 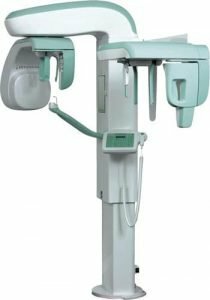 The scans are used for planning orthodontics, options for unerupted teeth and surgical solutions for teeth that need to be removed. They also reveal problems in the jawbone, particularly incidental things that may not be apparent with small X-rays or other diagnostics. We have a dedicated, lead-lined room for our OPG. The patient stands, uses a chin rest and bites on a small fork-shaped piece of plastic. The scanning unit moves around the head of the patient. It’s very non-invasive and great for patients who are prone to gagging. Additionally, the radiation exposure is extremely low. As the scanner moves around the head, the results appear immediately on the screen. A big advantage of having an OPG unit in-house is that we no longer need to refer to a medical radiology clinic. We have found this OPG to be a valuable addition to our business. While there are no negatives, it’s expensive to purchase and needs a dedicated space to set up. I believe this is the minimal level of technology required by all practices but, unfortunately, not every practice is able to own one.